I've seen a lot of recipes floating around online for homemade fruit snacks. They've peeked my interest and I've been curious if they were any good and if they were worth my time making. It wasn't until I spied these sour gummy stars at The Mommypotamus that I was finally compelled to make them--like right away. They just looked so good to eat, and fun. Not only are they yummy, healthy, and my kids love (seriously love) them, but they take only minutes to make. These little treats have become a regular snack at our house. My kiddos are always willing to help whip up a batch and they are satisfied that they take only about 20 minutes from start to finish (including chill time). The first several times I made them lemon flavored, but then decided to try orange. My two older kids love the sweetness of the orange ones, but my one year old and I prefer the tart lemon. 1. Combine juice, honey and gelatin in a pan over low heat. Stir until well combined and all gelatin lumps are dissolved. 2. Add orange or lemon oil. 3. Pour mixture into molds and place in the fridge for about 15 minutes. 4. Once firm remove gummies from molds and store in an air tight container. They will stay firm at room temperature once chilled and can be stored in the fridge for up to two weeks. I hope you give these little gems a try and enjoy them as much as we have. What a great idea to make these at home! And they look PERFECT! Wow, these look great. Can't wait to try. I love that you included the Essential oils. Great recipe.. and very cute! Please consider sharing your post with us at Eco-Kids Tuesday today! Love this! My daughter loves fruit snacks but the healthy ones are so expensive, and the others are just bad. They sound great! Going to have try them. I too have been looking around for the perfect homemade fruit snack! This recipe sounds great! I'll have to give it a try! :) thank you! I seriously want to try these... we love fruit snacks! I love the simplicity of these fruit snacks! I've made homemade fruit leather with great success, but I am definitely going to have to try these out! Wow, these sound so easy! We love fruit snacks at our house. We are going to have to try this recipe. Sounds like a perfect one to get the kids involved. Thanks for linking up at our party! I can't wait to see what you share next week! I bought some grass fed gelatin and plan to make these! I am featuring your post tomorrow! Thannks for sharing them with us at Eco-Kids Tuesady!! Hope you stop by again tomorrow! 1. How do you get them so smooth? Mine wound up with a coating of tiny bubbles, so the kids wouldnt eat them! 2. In Australia, food grade essential oil is hard to find. What brand do you use? I do order from iherb, so if they have the brand you use that would be great. 1. I found from experience that if I add the honey to the juice and cook on a low heat until combined and then whisk in the gelatin I won't get bubbles. If I add the gelatin to the juice and then add the honey I get a lot of bubbles. Looking forward to munching out on them. Now....I'm gonna check your website for some ideas on getting coconut oil in. I do find it difficult to ingest the recommended quota as I don't like it off the spoon, and I find even adding it to my daily mug of bone broth makes me nauseous. I'm sure I read somewhere recently about blending it with berries, setting in moulds and eating as snacks. Now that could be do-able! I'm glad you had better success this time. 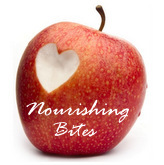 Feel free to visit my new food blog: http://nourishing-bites.blogspot.com/. I'll be sharing a delicious recipe this week that uses coconut oil.